How long has it been since Virginia beat Virginia Tech? I use this line in marketing classes that I teach, and will get to for at least another year. No Virginia fan has ever been able to post on Facebook about how their team beat Virginia Tech in football. Virginia last beat Virginia Tech in 2003. Facebook went online in 2004. YouTube, for further context, launched in 2005, and Twitter has been with us since 2006. Virginia Tech gained 102 yards of offense on its first 11 drives. On its final three drives, the Hokies gained 202 yards. The key to that, according to Hokies coach Frank Beamer, was offensive line play. Quarterback Michael Brewer threw for 182 yards and two touchdowns in the second half after accumulating just 55 yards through the air in the first half while getting sacked three times. Virginia did not record a sack after halftime. Virginia put up a season-high 262 yards on the ground, and it was the variety of ways that was most intriguing. Wideout Olamide Zaccheaus had 10 carries for 50 yards. Quarterback Matt Johns had 58 yards on six carries, including two designed runs, one, a naked bootleg, that gained 25 yards. Backup tailback Albert Reid had 103 yards, including a 57-yard third quarter touchdown. 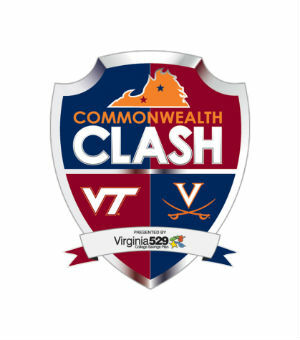 Virginia outgained Virginia Tech 433-304, had a 21-12 advantage in first downs, ran 78 plays to Tech’s 59, gained 5.6 yards per play to the Hokies’ 5.2, had a 34:37-25:23 advantage in time of possession. The Cavs had two turnovers to Virginia Tech’s one, but neither team scored any points off turnovers. Virginia was 8-of-18 on third downs; Tech was 3-of-14. Virginia had three sacks and six tackles for loss; Tech had one sack and four tackles for loss. Virginia did run one unsuccessful fake punt, to zero of those for Virginia Tech. Virginia had nine penalties for 65 yards; Tech had three penalties for 35 yards. Virginia placekicker Ian Frye was 2-of-3 on field goals, two good from 42, missing from 45. Virginia Tech placekicker Joey Slye was a perfect 3-of-3, good from 48, 44 and 41. My definition of big plays is runs of eight yards or more, and passes of 10 yards or more. So defined, Virginia Tech had 12 big plays for 257 yards of total offense; Virginia had 18 big plays for 322 yards of total offense. Attendance was announced at 53,777, 7,223 below the official capacity for Scott Stadium, and 11,170 off the attendance record set in 2008 against Southern Cal. At $60 per ticket, which is what my wife paid for her tickets online through VirginiaSports.com late Wednesday night, you’re talking between $430,000 and $660,000 in lost revenues just from tickets left unsold. Not a good day on the field, not a good day at the gate.